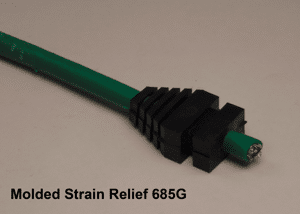 A strain relief is primarily a means of securing a cable to a device. 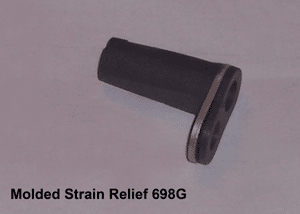 Strain reliefs can be divided into two groups: Stress relief and Bend protection. 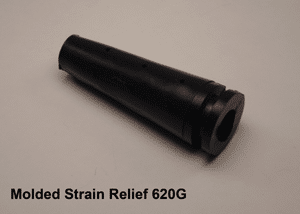 Strain Reliefs Offering Stress Relief Only. 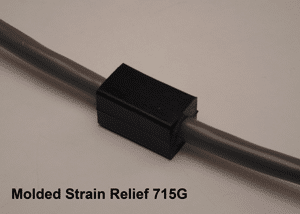 The most common strain relief is a clamp or compression style. 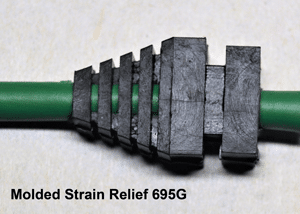 These reliefs are effective when properly applied. 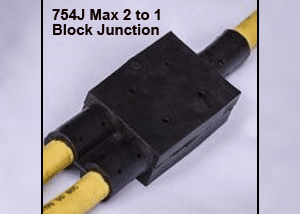 However, when these reliefs are improperly installed they can damage the cable, and/or degrade the assembly leading to electrical or mechanical risks. 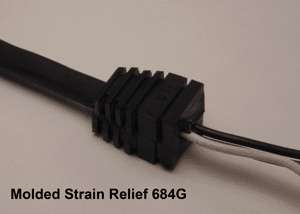 Most provide no bend protection. 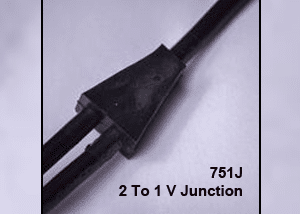 The cable can be addressed at acute angles which could cause damage to cable stranding and or the outer jacket. 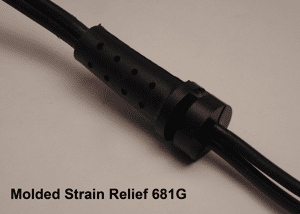 Strain Reliefs Offering Bend Protection AND Stress Relief. 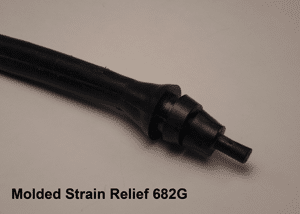 United Universal can provide a properly designed custom molded strain relief that encompasses both features. 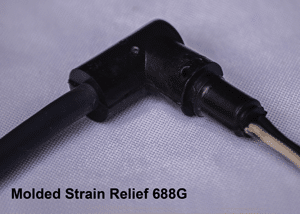 Or, offer to choose from one of our existing products such as 681G, 695G or 620G. 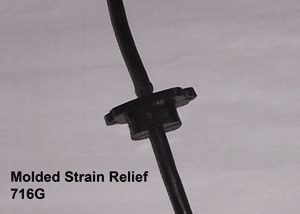 The bend protection basically increases the bend radius of the cable. 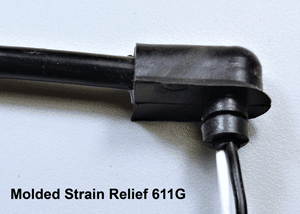 A minimum bend ratio is 2½ times the diameter of the cable, anything short of that will cause damage. Choice of flexible molding materials such as PVC or TPR also enhances the end product and add to the bonding process of the end product. 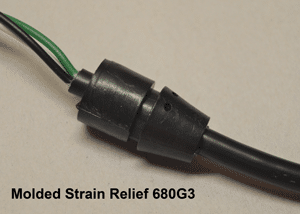 The final benefit to a molded strain relief is the enhanced “finished look” to your product. 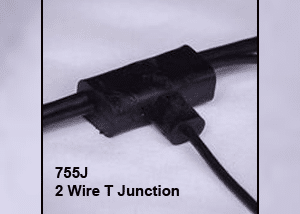 Molded junctions are primarily used to protect terminations or components from exposure. 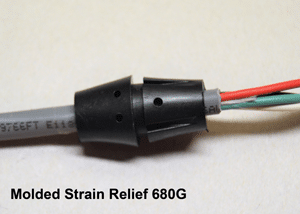 Overmolding a termination within a cable assembly or cord set provides both physical strength and an environmental seal. 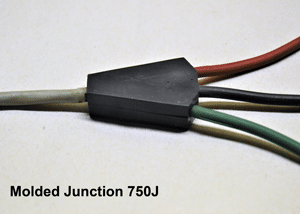 Also, United Universal molded junctions are splash proof. 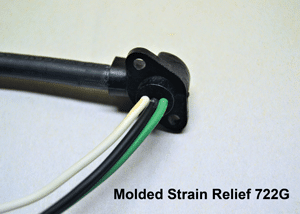 Most molded strain reliefs and junctions do require a custom mold. Our tooling is modular in design using inserts allowing to save costs. 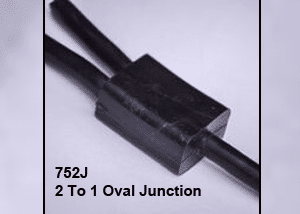 We use simple single cavity molds. 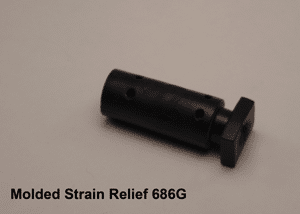 Sometimes we use existing parts at no extra costs. If you are interested or just curious take a look at some images of products we have provided to other customers.